Stanley Park Ecology Society’s summer day camps for kids run weekly, July through August. 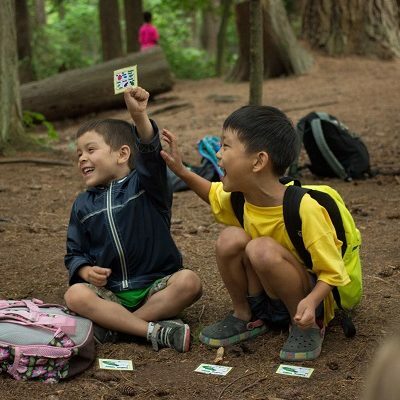 Stanley Park Ecology Society (SPES) is offering summer day camps for kids ages 7 to 11. Embark on an exciting educational adventure among the giant trees, sandy beaches and hidden wetlands of Stanley Park. Spot wild animals like otters and beavers, have a blast splashing at the beach, and learn while spending valuable time outdoors. Camp runs rain or shine 8:30 a.m. – 4:30 p.m.
Aftercare is available from 4:30 p.m. – 6:00 p.m.
We meet at the SPES office (610 Pipeline Road) then campers accompany their camp leaders into the Park to explore the forests, Beaver Lake, Lost Lagoon, the Seawall and more! Please note a detailed Parent Information Package and Camp Policies will be sent to you via email, shortly after you’ve registered your child(ren). Calling all kids to come connect with nature and make a difference! Join us for a fun-filled week exploring the diversity of Stanley Park and taking action through conservation and citizen science. Children will develop their leadership and team work skills and become true stewards of the Park. From exploring wetlands, to rainforest, to the intertidal zone, sign-up for an adventure your child won’t forget! How can you tell what an owl has eaten? Why are salmon so important to the forest? How do animals survive in the harsh intertidal zone on the beach?Sharpen your animal detective skills and learn how to use tools to find the answers to some of the mysteries of the forest and ocean! This week our campers explore the habits and habitats of Stanley Park’s birds, mammals, amphibians and more. Nature is beautiful, inspiring, and full of details, from towering Douglas-fir trees to tiny colourful bugs! Tap into nature’s design and your own creativity for a week of inspiring art projects and activities. As the Stanley Park forest enters the summer season, we’ll hone our senses to unlock its seasonal secrets and changes. Which plants are blooming? Who has migrated back? Where are the frogs? What’s making that sound? The forest is a wondrous place with many exciting mysteries just waiting to be explored! Have you ever wondered which geese migrate to Stanley Park, or how to identify songbirds? This week our campers learn about the amazing ducks, hawks, eagles, hummingbirds, and other birds of Stanley Park. Build a bird nest box, identify eggs, and have a hoot learning all about our owls! *Save $40 during this 4-day week. No camp on Monday. What do salmon, beavers, eagles, and cattails all have in common? Water! They are all part of our aquatic landscape. In this action-packed week, campers explore Stanley Park’s beaches, creeks, and other wetland environments, while contributing to Citizen Science. Cool off in the heat of summer by exploring the marine and freshwater ecosystems in Stanley Park. This fun-filled week is full of exciting activities that will prepare campers for outdoor adventure and survival. This includes learning which plants are edible, using a compass and map to navigate and building shelters. Campers will learn “Leave No Trace” camping principles. Register now to become a Stanley Park Survivor! As Nature is beautiful, inspiring, and full of details, from towering Douglas-fir trees to tiny colourful bugs! Tap into nature’s design and your own creativity for a week of inspiring art projects and activities.